Back Pogba to Stay at Manchester United at 1/3 with Betfair. After silencing his critics and winning the World Cup, Paul Pogba will not rest on his laurels and sit back now. Instead, he is going to be motivated more than ever to take the next season of his career by storm. The French midfielder might have had a tumultuous time last season in Manchester under José Mourinho - in which relationships were strained - but Pogba knows better to let go of a grudge and put bad energy to one side. It might not have been a perfect season last time out, but the World Cup-winning midfielder is coming back to Manchester United as a leader. No longer is he just a world-class player, but he is also an excellent spokesperson. Video clips leaked by France’s governing body showed Pogba handling the pre-match and half-time team talks to his fellow compatriots. If anything was made clear from the behind the scenes footage, it was that the former Juventus player is a natural born leader. His speeches were elucidating and persuasive; he showed that he will not shy away when the going gets tough - especially in the biggest game of his career. After Michael Carrick announced his retirement at the end of last season, there is a current vacancy in the captaincy at Manchester United. While Antonio Valencia appears to be the frontrunner for the position, Pogba, even if he does not get it, can still provide great value on the pitch and lead by example. It is a given that the Frenchman is going to be a vocal leader in that dressing room from now onwards - there is no hiding now. Due to a poor few games in the middle of last season, Mourinho decided to drop Pogba in perhaps the most crucial game of their campaign: the Champions League knockout match against Sevilla. Instead of choosing the dynamic Frenchman, the Portuguese boss chose Scott McTominay - a trustworthy, industrious player to make his debut in Europe. It was a risky move that, in the end, did not pay off. It was understood that Pogba was considering his future in mid-February, especially after being asked to carry out more defensive work against lesser teams such as Brighton & Hove Albion. Of course, Pogba is capable of fulfilling such duties in the team, but his prowess comes further up the pitch, and that is where he thinks he can make the most difference for his club. Plenty of speculation has arisen over the last few months, with clubs such as Real Madrid, Paris Saint-Germain, Barcelona and even his old team, Juventus, being rumoured to have an interest in taking him. The current favourites, Massimiliano Allegri’s Juve, are 4/1 to sign him before the end of this window with Paddy Power. 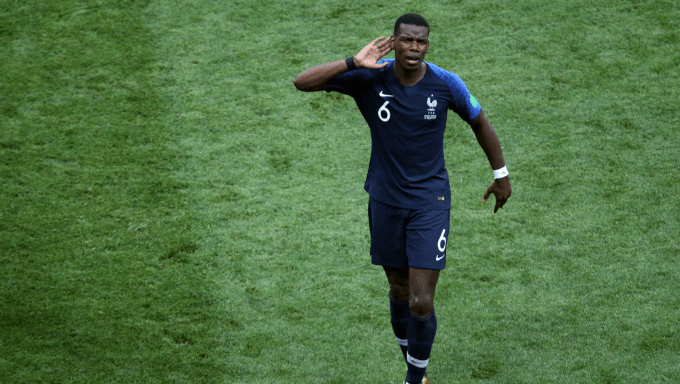 As seen for France throughout the length of the World Cup, Pogba can bring a sense of professionalism and creativity to Manchester United. He should have been licensed to roam into those attacking areas last season, but Mourinho’s defensive philosophy has, so far, prohibited him from doing so. Perhaps the most impressive attribute of Pogba’s is his ability to get his team on the front foot with one simple pass. While it is simple for the Frenchman, only a handful of players (if that) can pull off some of the things Pogba does, especially with heavy pressure constantly on him. The Red Devils need his composure and influence to move forward and up the pitch quickly - the transition from defence into attack in one swoop. Mourinho needs to play it smart from next season onwards. Fans were beginning to turn their heads last year when the philosophy became to ‘not lose’. Manchester United supporters will not watch their team adopt negative tactics and misuse players. In a sense, Pogba is a once-in-a-generational talent with how he approaches the game from midfield. He might not be the quickest, strongest or most naturally gifted in the world, but his devotion, professionalism and leadership qualities show why he is one of the most recognisable players on the planet. The player himself will not accept another season where he is playing in a much deeper position against lesser opposition. Pogba will happily go along with the manager’s tactics in important, toe-to-toe fixtures, but against teams the club should be beating, the Frenchman should be allowed to pose a threat in front of goal. Case in point was when the Red Devils found themselves 2-0 down at the Etihad to their rivals, and it was Pogba who stepped up to the plate and found a source of inspiration to complete a 3-2 comeback. That is the damage that Pogba can provide in the final third of the pitch for his team. The World Cup winner is 1/3 to stay at his current club this summer with Betfair, but he will not stick around forever if Mourinho is not getting the best out of him this season.